I was reading about the polar performance experiments and was somewhat surprised about the upwind performance of your rig and the aerojunk versus the bermudian and split junk. Paul McKay mentioned he would narrow the slot and flatten the main on his rig to improve it. It seems to me that the things you are doing on the newest version of your rig will help as well. One thing I was wondering about was if the difference might be due to the lower aspect ratio of both rigs compared to the others? Or maybe we just need more data? Thank you for keeping up at the "quest"! It's very exciting to me to follow along with your progress. I think it's not advisable to read too much into the testing we did last year, particularly comparing different boats. As Alan said in JRA magazine 79, there were other factors affecting the results. I was fully familiar with Weaverbird and her rig by that time, so could sail her reasonably well, but it was literally the first time that the test equipment was deployed, and Alan and I were learning how to operate it to gather data and process it. Then there was a question about whether Calisto was being sailed in optimal fashion. Then Miranda's rig was not in a fully shaken-down and optimised state. With Calisto, Miranda and Poppy, Alan was having to go aboard boats that were new and unfamiliar to him, and try and get them sailed at their best while gathering data. Not an easy task. And then the various venues and sea states will have posed more questions. Calisto and Poppy are somewhat larger than the other two - were they handling any given sea state better (or worse) because of their size and/or hull type? So I think it will always be a bit risky to read too much into boat-against-boat tests. We will be on much firmer ground when we can do some "before and after" testing on one boat in similar wind and water conditions. Weaverbird with her current JR rig will bear comparison with any other cambered JR, and I wouldn't expect the instruments to show that one is markedly better than another - but when the rig is changed to the new wing sail, will it be possible or not to record a noticeable difference in performance? If so, will we be able quantify the performance improvement that I get, versus the extra work to make the rig? Could we do the same on a boat that changes from flat to cambered JR? It's early days, though. Let's see if we can add to our store of knowledge this summer. I have also just added the polars for the four boats here, so you can see where the curves in the comparison charts come from. I have today added a page under the Technical Information heading which shows the performance of the 4 boats tested so far at each wind speed (6, 8, 10, 12, 14 kts). They can be seen here. These were created in Excel from data tables produced by Anthony Cook. he has spent time over the last couple of months developing software that creates these tables from the raw csv files. We have tried many different filtering options to try and cut out any misleading data points caused by rapid rounding up or bearing away, or by rapidly dropping wind speeds. We have found that a maximum wind speed drop of 0.7kts per second is a reasonable limit. We have tried several different limits for the rate of change of the wind angle, and have found that +/- 10 degs per second gives the best results. I will be interested to see what everybody thinks of these results! Robert, the smoothed curve for Miranda at 12 knots extends across the centreline, which can't be right and doesn't tie in with the data plot for that speed. Alan--Yes, correct. It's an aberration due to low sample size...only 6 points in the "12 knt", "40 deg" bin. Definitely a case of over analysis. I left it in to show the perils of applying sophisticated math functions to less than adequate sample sizes. You get meaning-less results. In prep are pdfs showing polars for 1) all boats, all even wind speeds, 2) all boats , all odd wind speeds, 3) scaled stw's (Alan's factors) all boats, max upwind vmg's, max downwind vmg's and beam reach (90 deg) stw's. The rescaling, i.e. multiply STW's by Alan's factors, I think attempts to isolate the effects of the rig type by correcting for the boat's characteristics ...length, displacement, sail area, etc. Here are the results of comparing boat speeds, after scaling by Alan's factors (see his spreadsheet below). 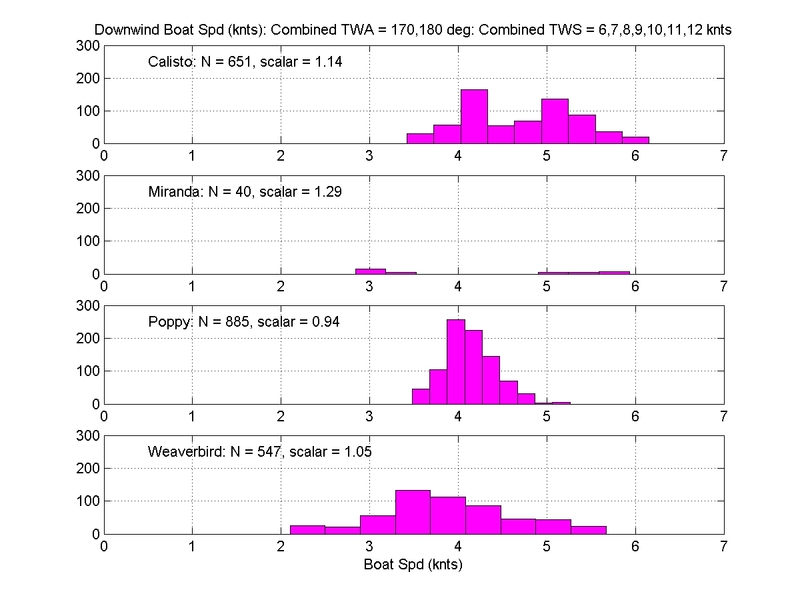 My approach is to compare the frequency distributions of boat speed in three categorys: max upwind vmg's, beam reach and downwind. The histograms are unambiguous if sufficient sample size is available. These data were collected at 1 second intervals. Around 1000 points or seconds or 17 minutes of data appears to be a minimum to get a close approximation to a bell-shaped curve. To gain sample size I've had to combine boat speed results from more than one true wind angle and more than one true wind speed. Upwind vmg: combined 40 & 50 deg twa and 6-12 knt tws. 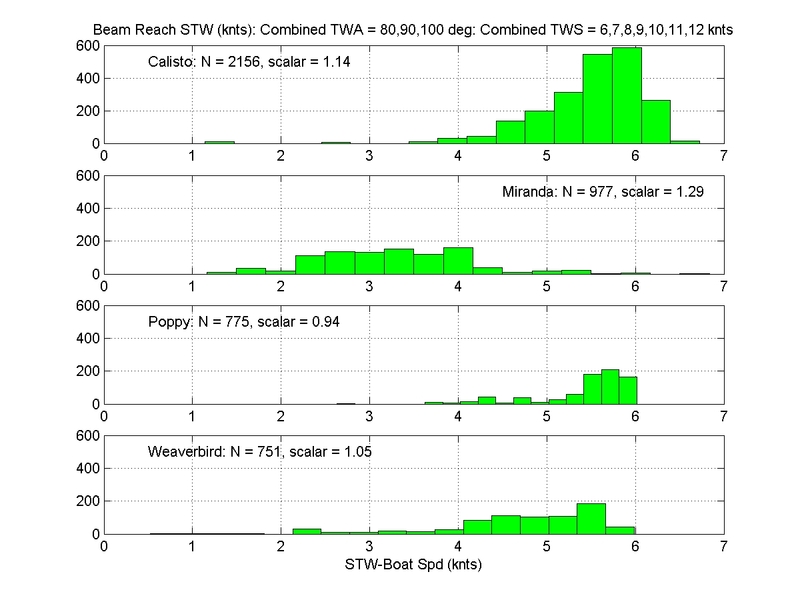 Beam reach: combined 80, 90, 100 deg twa's and 6-12 knt tws's. Downwind: combined 170 & 180 deg twa and 6-12 knt tws. The more points the nicer the shape and less ambiguous the comparison across boat designs/rig types/before and after conversions to junk rig (in the future). I'd advocate more data (keep or increase the current data rate) not less. In Alan's scaling factors Poppy is deemed fastest (longest waterline, fairly high SA/D) and calculates a factor of 0.94. When applyed (multiply every boat speed by 0.94) reduces Poppy's boat speeds by 6%. Miranda, deem slowest of the four, had a factor of 1.29...all boat speeds were increased 29%. Weaverbird's factor was 1.05 and Calisto's 1.14. The Poppy and Weaverbird histograms tend to overlap on all courses. Conclusion, the scaling correction explains boat speed differences in the original data. Miranda is the slowest boat on heeling courses (upwind and beam reach) even after the 29% factor boost. Downwind, although the data count is sparse at only 40 points, it tentatively looks like Miranda would keep up with the other boats. My best guess at an explanation is that Miranda had the lowest ballast-to-displacement (B/D) ratio and (B/D) is not one of Alan's criteria. A higher ratio would mean less heel, carry more sail, reef later probably resulting in higher speeds on heeling courses. Calisto (bermuda rig) was the fastest boat upwind but on the other courses there was overlap with Poppy and Weaverbird. Combining Poppy and Weaverbird mean upwind vmg's by eye I get around 2.6 knts. Calisto's vmg is about 1 knot or 38% faster. Alan's 1.14 factor is reasonable meaning that a 14% boost to boat speed for this comparison does not explain the difference. The Varne 27 design is moderate in most respects: SA/D, B/D, LWL. The design does have the highest D/L which would tend to make it slower not faster. Given everything that is known the 38% higher upwind speed is anomalous. I look forward to analyzing next summer's data. For me the hard part of writing the code is done. Today it'd take me hours not days to process 40,000 lines of data ( 4 boats 10,000 lines each) from raw csv's to polars to summary histograms. as a helmsman i never steer a really straight course. while meandering some 5 to 10 degrees to either side of the main course, the hull speed will drop a little bit, but the data collected on the windward side might show far better results than you could sail in this direction. a solution could be to sail a strait course for a couple of minutes and then interpret 30 second or one minute blocks of data to interpolate the main direction, main boat speed and main wind speed. imho this would give more accurate (but lower) performance results. This is a very interesting point. When sailing upwind (in a race) in any sort of sea one does adjust the helm frequently to get the best performance to windward. Also, the wind is constantly shifting, so one adjusts for that as well. When we were doing the trials we took a rather different approach. We set the sails to what looked like a good sail trim setting for a particular wind angle, and then tried to follow the wind at that angle for a bit, and then slowly varied the wind angle up a bit or down a bit, hold it for a bit, then adjust it a bit more, without changing the sail trim. This was to try and explore the "envelope" for that set of sail trim positions without assuming we had set it perfectly initially. Upwind we would squeeze it up until the luff started to lift, or it was obvious we were slowing significantly and needed to bear away to get the boat moving again. This meant that we inevitably included data for sailing higher than the optimum angles, but that was our intention, so that we would be able to see that the performance was dropping off when we were sailing too high. There is a risk when doing that if we change course too fast and carry the high boat speed from the optimum angles up to the "too high" angles. I tried to ensure that we always changed course quite slowly to minimise this risk. However, now, in the software that Anthony is creating, we are deleting any data points where the wind direction changes by more than 5 degrees per second (and all subsequent data until the boat speed changes). This eliminates about 10% of the data. There is a trade off between eliminating data and having enough data left to create a polar. Given that the wind is constantly shifting, it would be impossible to find blocks of data of 30 or 60 seconds where there is no change of wind direction. In our judgement setting this filter to 5 degrees eliminates the big and rapid variations of direction, but leaves "reasonable" data alone. I think Anthony is making this a variable that users can change, so we will be able to explore the effects of setting it to tighter angles if we want. We picked 5 degrees because I didn't want to eliminate more than about 10% of the data. We also looked at 10 degrees, but maybe we should also look at 4, 3, 2 and 1 degrees, but the amount of data deleted will shoot up quite rapidly. In practise, when doing the tests, we found it was very difficult to maintain a very steady wind angle because of the natural variations in wind speed and direction, and the time it takes to steer the boat round to compensate for a wind shift. So, I think we are doing the right thing in recording the data every second, and then filtering the data at the analysis stage. When I see the clouds of data on one of the diagrams in Reply# 6929495, I wonder; could it be that it is the sensors, or rather the sampling rate of them which is not optimal. I only own a simple Garmin 72 GPS, myself. However, I mean I remember that I could set up the damping of the speed. What was presented was an average over 2, 5 or 10seconds, something like that. With the shortest setting, the speed would fly up and down with over a knot, all the time. With the 10s damping, the speed only jumps with 0.2 – 0.4kts, at most, at each updating (once a second?). If the sampling of your sensors could be dampened in a similar way, there may be less of a job for later algorithms to struggle with. It is an interesting thought. I don't recall that the sensors offer that option for averaging over time. I suspect it happens in the instrument or in the computer driving the instrument. On the first test results we had a problem with the multiplexer being overloaded with incoming sentences, which meant that the boat speed was not changed every second, but at random intervals, sometimes as long as 20 seconds. This meant that the response to increasing and more importantly decreasing wind speed was delayed. That is why with Anthony's software we are eliminating not only data points where the wind drops by more than 0.7 knots per second, but also all subsequent data until the boat speed changes. In Polauto we have the option to average over 1, 5, 10, and 15 seconds and what that showed is that we ended up with too few data points and very spiky results. Personally I think it would be best to record wind speed, direction, and boat speed every second so that we can see how the boat speed changes as the wind speed changes, and get a sense of how the boat accelerates and slows down. We can always apply averaging to this data if we want to and see what effect it has, but if the original data is averaged, we are stuck with it. that was very impressive numbers. I have never seen polar diagrams where the boats sail 30 deg. from the true wind direction before. Could this be apparent wind angle? In that case, the VMG to windward will not make sense. We rig the anemometer on a short mast way out on the quarter, as this is where we can get it furthest way from the rig. Yet it's not a perfect position. If you race, you know that if a competitor gets onto your lee bow, he deflects the wind that you feel, heading you so that you fall away into the windshadow behind his rig if you don't tack away. Our anemometer is reading a wind that is a few degrees more "on the nose" than the ambient wind, I think. An anemometer on a short mast at the bow is in a worse position, in the upwash as the wind approaches the rig. An anemometer at the masthead is also not in the true wind, and is probably going to be somewhat affected by the tip vortex at the top of the rig (and, dynamically, much affected by pitching and rolling). How much affected, I don't know, but that's the source of all the data that's been collected to date on sailboats' performance, and is the source of our feeling that 30˚ apparent, 45˚ true is what we should be aiming for as an achievable target. I think David may well be right that our anemometer position has meant that the upwind angles are being affected by the effect of the rig on the airflow. So what can we do about it? We could apply an arbitrary correction to the data we have, so that, for example, we increase the wind angle by 10 degrees at 35 degrees true and taper it off towards zero degrees and towards 70 degrees using a sine curve. That would bring the polars we have back into "sensible" territory. applied during the true wind calculation would achieve the desired result. NB; The PI()/180 term converts from degrees to radians and the 180/PI() converts back from radians to degrees. Longer term, we can, and I think we should, retest some or all of the boats tested so far, with the anemometer mounted on a long pole attached to the bow to get it as far forward as we can, and at the same height as in the aft position. The cable on the anemometer is long enough to do this. We can than compare the upwind results we get with the results we already have to see what the effect really is of mounting the anemometer aft. Then we can adjust the correction factor above if needed based on observed differences. Obviously we should ignore any results with the wind aft when the anemometer is forward as they will be seriously affected by the sail! Then, for testing any further boats, we should put the anemometer forward for upwind sailing, and aft for downwind. It would not be hard to do that. Looking through the polars Robert has produced I can't help thinking the results are being skewed by taking the median value for each group of points. 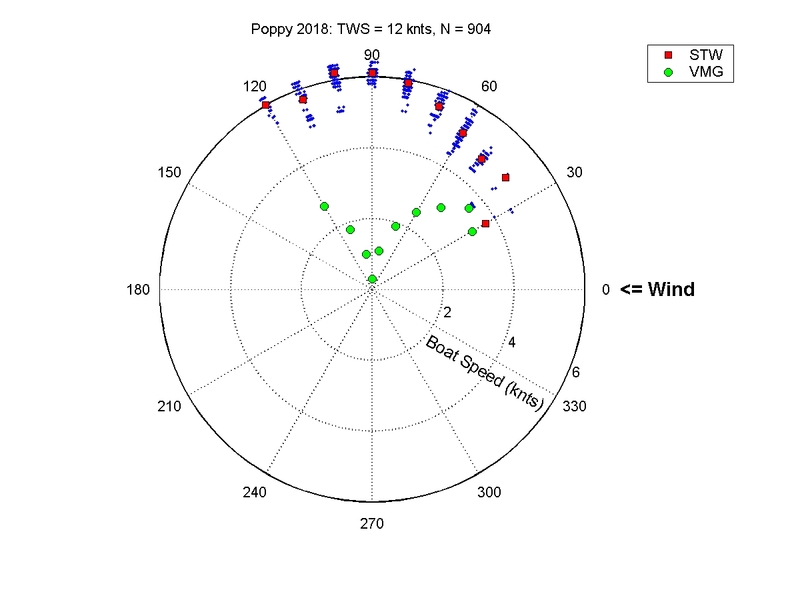 Taking Poppy at 12 kts wind speed for example, the values at 40, 50 and 60 degrees are pulled in by the number of low speed data points, while at 30 degrees the median appears near the top of the range of values. The display of the data points makes me think that taking the highest point at each angle would produce a better curve. Possibly taking, for example, the mean of the top 5 values would produce an even better curve, smoother and with a better defined optimum VMG.